The primary purpose of this utility is to locate and delete links within the active Microsoft Excel workbook to external files that are creating problems. 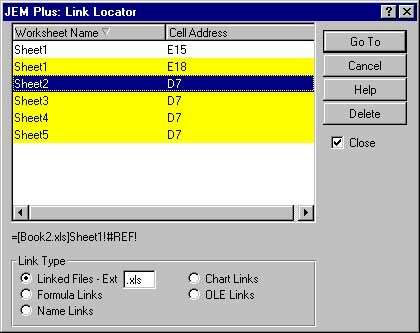 Excel can provide a listing of links to external references, but it does not tell where they are located. The Link Locator not only tells the location of the links, but also provides the functionality to go to or delete the reference. Below is the screen shot of this utility.